I grew up on spaghetti with Ragu. Not the lowercase italicized ragu, but the capital R followed by a copyright sign Ragu. And it was Hunt’s more often than not since it was cheaper. As a child, I always wanted the meat flavor thinking that it sounded better than plain tomato. Then one day, I thought it was odd that there wasn’t actually any meat in the sauce. Upon further inspection, the sauce was merely “flavored with meat.” Gross. When Steven and I first started dating (now nearly a decade ago, crazy right? 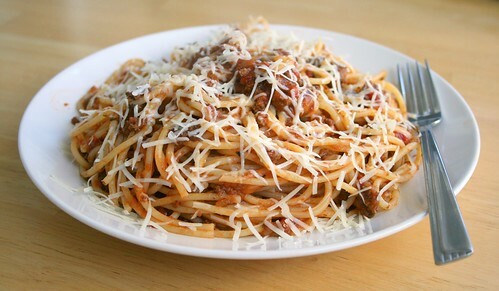 ), he made some spaghetti for me with his mom’s homemade meat sauce. The sauce had actual pieces of real meat, onions, chunks of tomatoes, and oh my god are those herbs? This is also how Steven introduced me to cheese. Like many Chinese people, my family was very suspicious of cheese. Stinky tofu? Bring it on! Fermenting milk? Nooo thank you. But Steven eventually won me over with a little freshly grated parmesan on my pasta. When I started cooking, I first learned how to brown meat and chop and saute an onion. I doctored up jarred spaghetti sauce with ground beef and onions. Then I bought my first jar of herbs, Spice Island Italian Herb Blend, and added some of that. I eventually switched the jarred, overly salty stuff to plain tomato sauce. Over the years, I added more and more ingredients like diced tomatoes and some red wine, and finally topped it off with some fresh basil. This recipe has come a long way. Heat a tablespoon olive oil in a large saute pan or Dutch oven and brown the ground beef. Drain the fat through a fine mesh sieve and set aside. Add a tablespoon of olive oil to the pot and heat over medium heat until shimmering. Add the onions and 1/2 tsp of salt and cook until softened. If the bottom of the pan is turning too brown, add a little bit of water and scrape up the bits as you go. Add the garlic and cook until fragrant, about 30 seconds. Add the wine to deglaze the pan and cook until the wine is completely gone. Add the tomato puree, drained diced tomatoes, pepper, and oregano. Cook the sauce at a gentle simmer over low heat, partially uncovered for 2 - 3 hours or until the sauce is thicken and ground beef is tender. gasp! steven, how could you?! hahaha. just kidding. I love to doctor up jarred spaghetti sauce. I love your additions! I just made spaghetti tonight, and wasn't too happy with the sauce. I've noticed that when I used fresh veggies and seasonings, the sauce comes out so much better than when I use just dry spices! :) Do you have any more tips for how to make the perfect, basic pasta sauce? Tasty! Congrats on medical school! You're right, fresh herbs would be so much better than the dried stuff. I guess a big difference is whether you cook the sauce quickly (it will be fresher) or simmer for a long time (it will have deeper flavors) :) I'm really no expert on tomato sauce, sorry I can't offer more tips. that's a good looking sauce, and hooray for medical school! do you think i'd get a price break if i made this sauce for my electrician? i don't need anything as big as getting into med school, just some recessed lighting. That IS a hearty sauce! I've just discover your blog, it looks really nice. I'm staying to see your recipes. Greetings from Chile.